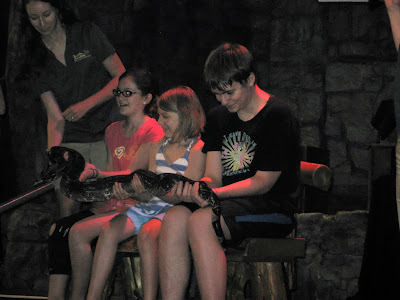 I shared a picture last week in this post from my trip to Busch Gardens. Now I want to tell you more about it. I was invited to attend a Mommy and Me meet up with Mom Central. It was supposed to happen previously, but had to be postponed due to tropical storm Andrea. I'm not sure the total, but there were about 20 other families (other mommy bloggers) who attended also. They were pretty excited, since it was our first time going to Busch Gardens, Williamsburg. We have lived in Virginia for almost 2 yrs, but hadn't been before. When we entered the park our group got to meet a mommy and baby sheep. Here's my son petting the baby. Then we were all treated to a delicious buffet breakfast. There was everything from danishes, to eggs, sausages, etc. (I should have taken a picture of it) but being a newbie at these events I didn't think of it. Then we heard a talk by some different people. I'm not sure her exact title, but one of the directors of Busch Gardens spoke and the Founder and CEO of Mom Central, Stacy Debroff spoke. They talked about how, Busch Gardens had hired Mom Central to do a survey. The surveyed about 900 moms, and the results were that mom's think their kids are disconnected from outdoor play, and natural fun. Kids today are spending too much time indoors. And playing video games, etc. Then someone who works with the animals came onstage. There was a turtle, a couple of cool birds. Then she asked for volunteers. My son got picked to go up stage. They got to meet "Bob" the snake. My son didn't know what he was going to be holding up there, but he said after he liked doing that. Then around noon time,. we were "let loose" to go and enjoy Busch Gardens however we wanted. We ran around the park literally for 7 hrs after that. I don't have time to list every single ride or thing we did. But we were non stop go for that whole time. Of course I was relying on my digital camera, and after that last picture of my son & the snake, it died. So luckily the kids had either an ipod (my son) or a cell phone (daughter) to take a few pictures. Dad & son pictured in back on "Verbolten"
This roller coaster is described as lightning fast and features an 88 foot plunge. Let's just say, that was the first & last roller coaster my son went on. Unlike my husband who went on all but one roller coaster at Busch Gardens (just because he didn't see it) and some more then once! I think my daughter went on this at least 5 or 6 times. This is just the highlights of what we did. We went on many more rides, saw lots of animals. And saw a show called Pet Shenanigans. It was really cute and featured all kinds of pets that they have rescued from shelters. My kids (especially my son) do fall into the category of not getting enough outdoor and natural play. Probably to much time on the computer. So it was nice to spend a family day together at Busch Gardens! Awesome, my kids would love it there! How awesome. Sounds like a great day. I went to the one in Tampa years ago and we had a fun time. That looks like such fun! The snake would freak me out - your son looks so brave. Oh, and I've never been on a roller coaster in my life! Not even a baby one. At this point, I don't even know if I ever will. Wow. never on a roller coaster? I used to be more fearless and went on them in my younger days. This time, I chickened out all day. Until the very last one, called the Loch ness monster. I went on that with my husband and It was scary but cool too. Looks like a great place to visit. We've been to the BG in Tampa, but not the one in Virginia. It's on my to do list. My kids are also not as active as they could be, but we're working on that. Ah! That looked like so much fun. I haven't been to Bush Gardens in years, and completely forgot (or never knew) they had so many animals. lol. Fun piece! I love VA & Busch gardens. I have family & best friends there. We went last Summer for my friend's wedding. We took my daughter to Busch for the 1st time, but we ended up having heavy downpours. So we left early. WW "Best Day Ever @BuschGardensVA Williamsburg"